We were at the main road before 7:00 AM to catch the jeepney bound to Bontoc. Our guide advised us that we have to be there on time because that was the time that the jeepney will pass by the area. Soon enough, the jeepney arrived. My buddies, Elal and Doi, and I rode the jeepney on top load while Julius seated inside. It was the day that our group set off to explore some villages in Tinglayan. I didn’t expect that the municipality has several villages that tourists can get to. I only knew about Busculan, which I regularly see from different blog posts that I had read. Our guide was Kuya Moises. He and Mang Johnny helped us decide our route for that day and the villages that we would be getting to. Because we were only have a full day to travel around, we agreed to three villages to visit such as Buscalan, Loccong and Butbut Proper. 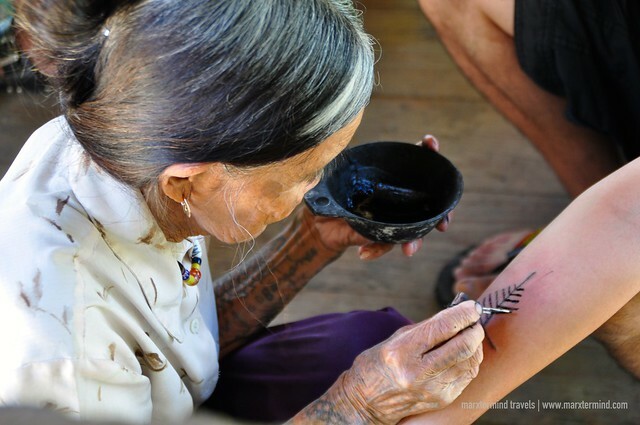 Kalinga had even become more popular destination because of Whang-od, the last tattoo artist of her tribe. 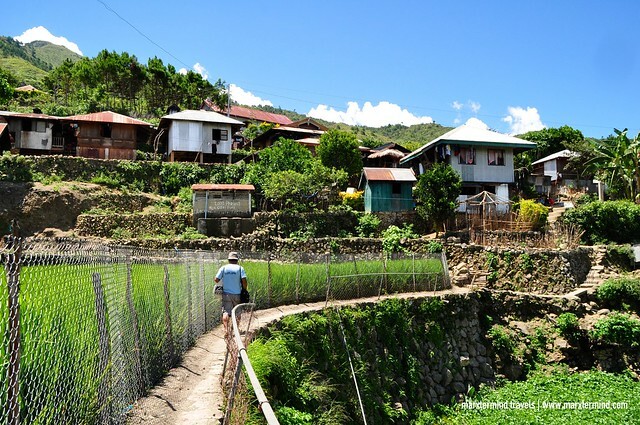 Tourists started to visit the village of Buscalan to get inked but spending a little more time to get around this place will immerse you to the life of the community. 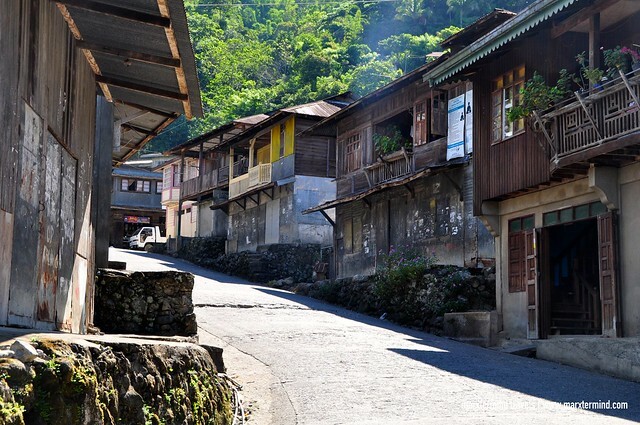 Most of the tourists choose to stay in Buscalan to experience what life in the village seems like. Accommodations are in home stay style. They can prepare meals for you but food can be limited to beans and vegetables. So I suggest that you bring food with you, canned goods perhaps, if you are very particular with this. We alighted at the town of Mar-o (PHP 20). 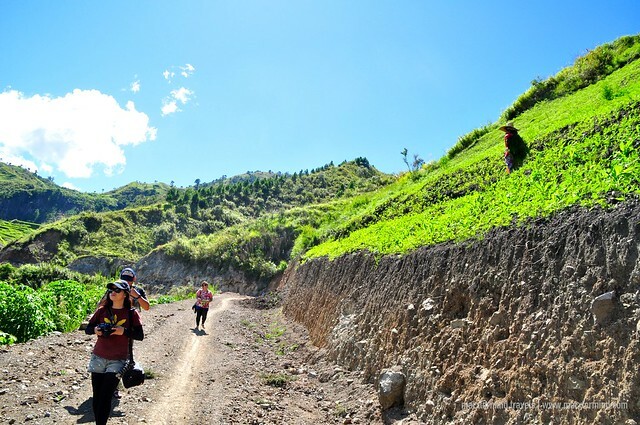 Getting to Buscalan from Mar-o or the nearby Bugnay Junction takes about 2 hours of trek. But it could be cut into an hour if you opt to ride a motorbike (PHP 100) going to the Turning Point. 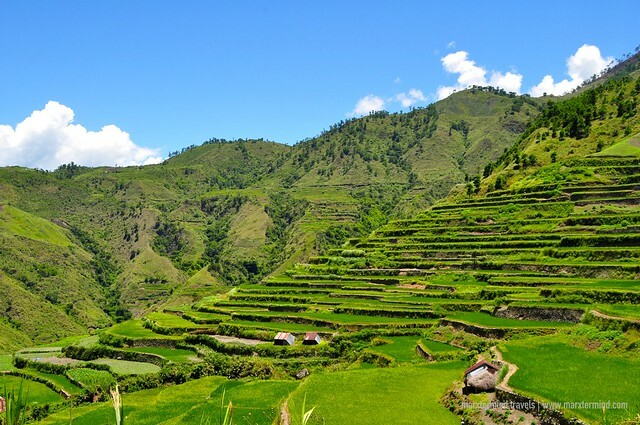 From Turning Point, it’ll just be an hour to reach the village of Buscalan. Several vehicles were parked at the Turning Point when we arrived; it looked like that there were a lot of visitors in the village. 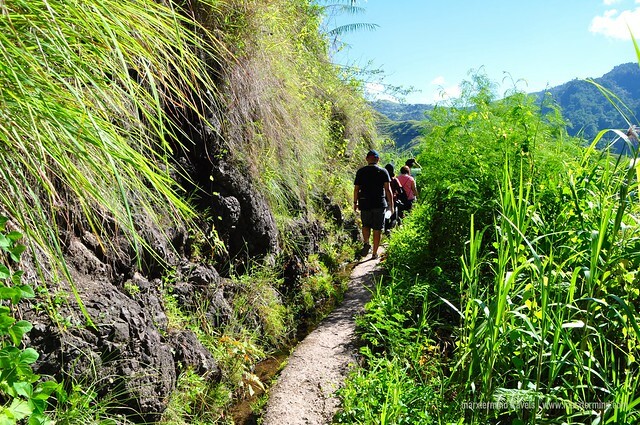 We continued our journey by hiking through the narrow path leading to Buscalan. As we walked along, our group noticed a rope way conveyor. Our guide told us that the rope way conveyor is for cargo and other goods. According to him, it costs PHP 1 per kilogram. Julius hilariously uttered if he could ride into that conveyor to reach the village easily. Lol! We stopped by a small waterfall first before we headed to the village. 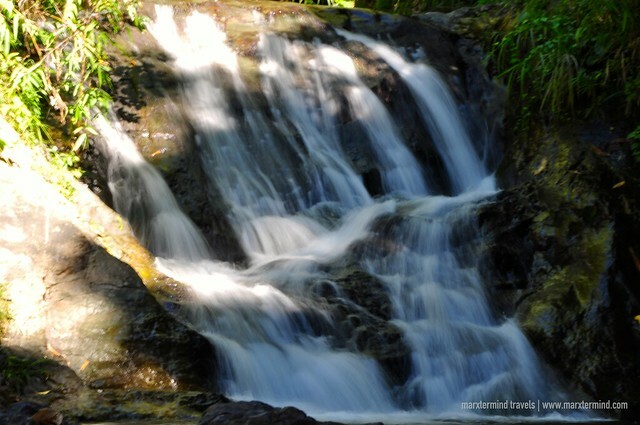 Though the hike felt just like a walk in the park, we found our visit to the waterfalls as a refreshing stopover. We had our water bottles filled up at a potable water source before we had left the area. We continued our ascent. The trail this time was a little more difficult but the beautiful surrounding kept us all determined to move further. 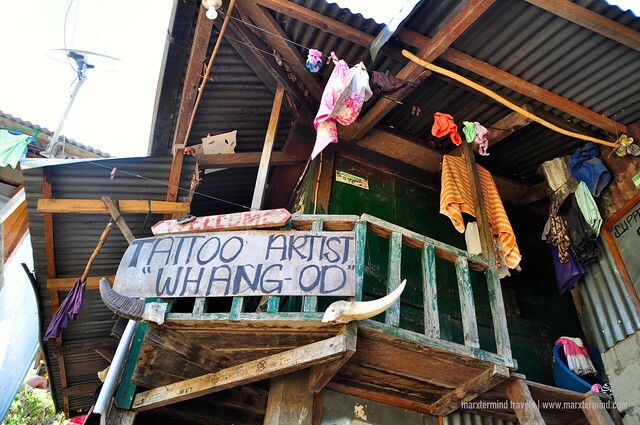 We knew that we were already in the village when a house welcomed us with a signage that says “Tattoo Artist Whang-Od”. 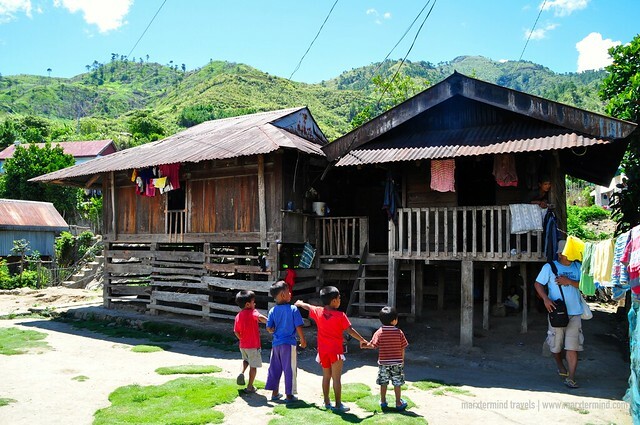 We looked for Whang-Od and we were told that she was at the house of her grandniece, Grace. We quickly went to the house and there we saw the load of tourists desiring to get inked. 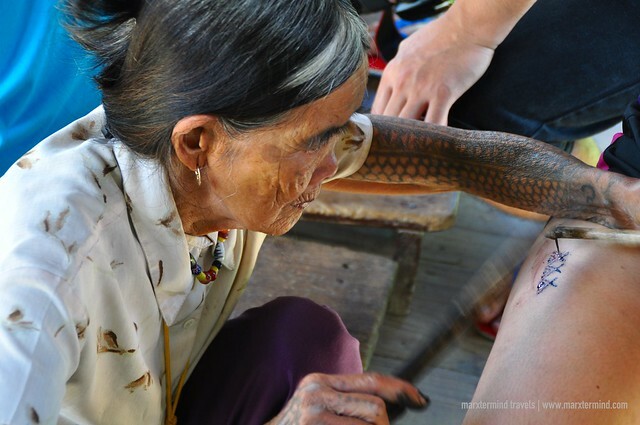 Whang-od continues to practice the traditional tattoo (batok) with her grandniece, Grace. The province of Kalinga had a strong tattoo tradition. For the people of Kalinga, tattoos have purposes and characters. The tattoos signify strength and beauty for the old folks of the tribe. Seeing the 95-year old tattoo artist was an honor for us. We didn’t intend to get inked but meeting her in Buscalan was already such a privilege. We paid PHP 50 each for environmental fee for our visit to the village. But before we had finally left, our guide told us to have our lunch first. He invited us to go to Grace’s house, and there we had our meal. A vegetable dish that appears to be a young jack fruit boiled in water was prepared. The meal was plain but that will do at that moment so we can last our hike going to the following villages. 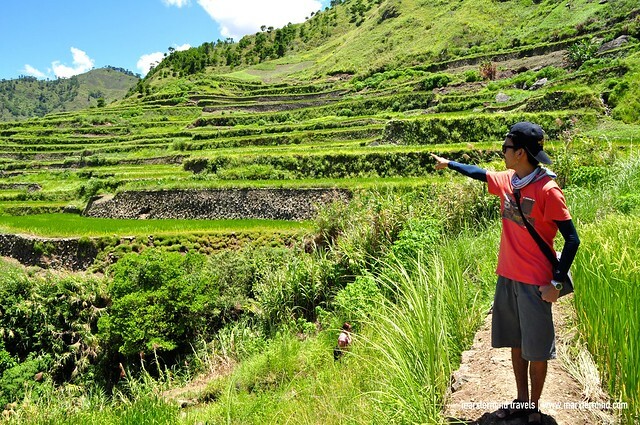 The beautiful rice terraces kept us all enthused to continue our hike to the next village. The scenes along our trek were truly stunning that we couldn’t help but to stop for some times to take pictures and have our profile-picture-worthy poses. 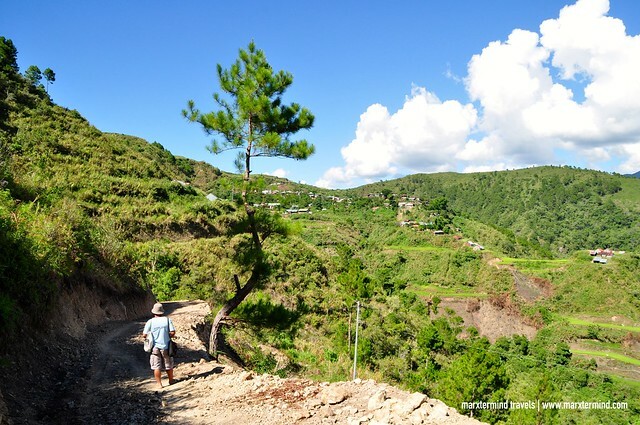 The hike to Loccong from Buscalan normally takes about an hour according to our guide. But we were able to reach the village quicker. Now, that’s the spirit of a real explorer! 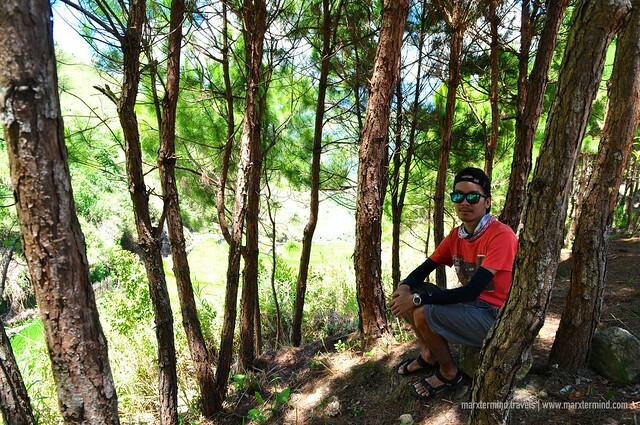 A small area bounded by pine trees nearby the village served us our resting area before we finally continued our hike to reach our destination. 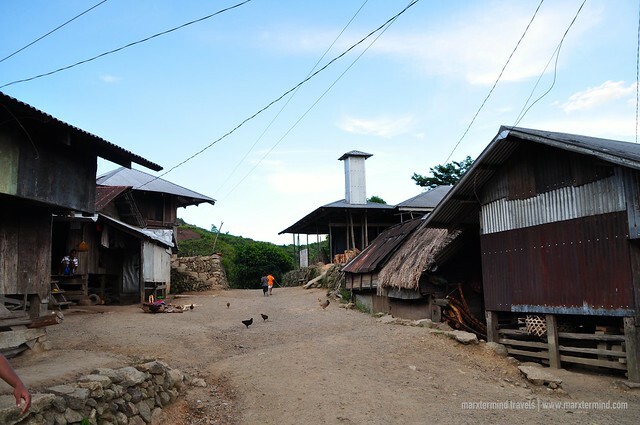 Loccong is one of the villages in the outlying area of Tinglayan. 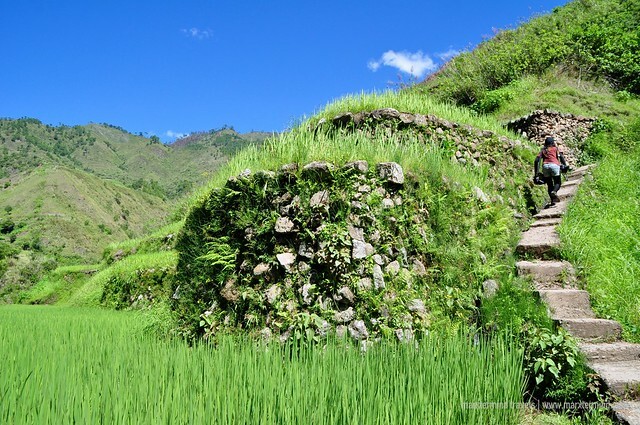 It was quieter than the village of Buscalan. People are friendly. Kids were always ready to pose for camera even though we didn’t ask to. It looks like they just happy to see new people visiting their lovely place. We didn’t stay longer at the village. We resumed our journey after resting for a few minutes. We walked through the dirt road towards Butbut Proper. The trail was new and was being cemented so vehicles could reach the village of Loccong from the main road. The trail was more relaxed. 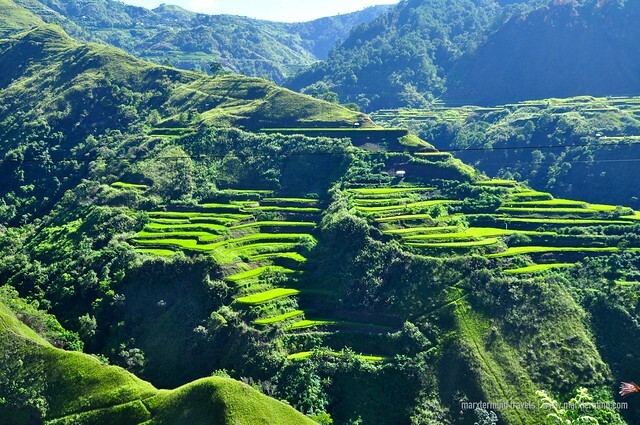 The view along the track was spectacular, which is made up by vast mountain ranges and beautiful rice terraces. After hiking for more than an hour, we finally reached the village. Kuya Moises brought us to a house, which seems to be a regular area for visitors to stay. The owner warmly welcomed us. 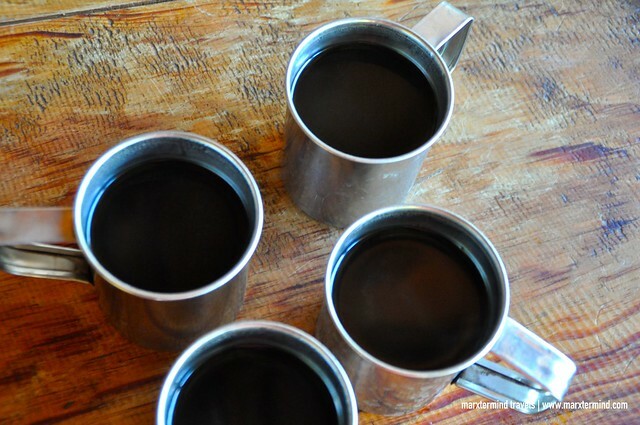 She prepared fresh cups of Kalinga coffee for us, which we didn’t refuse at all. There is really something about the coffee in Kalinga. I’m not a fan of coffee but I fancy how the brewed coffee from this place tastes like. 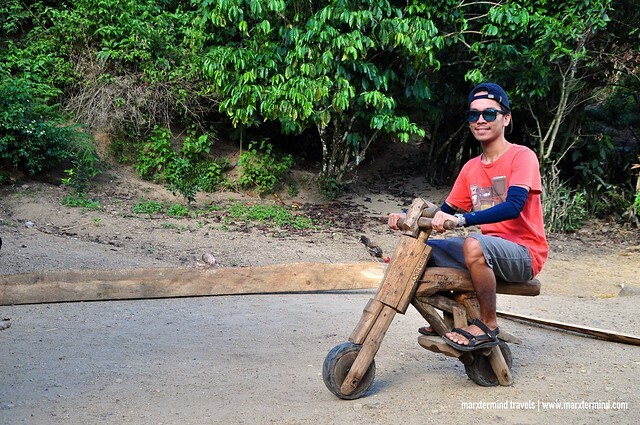 Kuya Moises told us that there were no available motorbikes yet that could take us back to Luplupa. Most of them were at the downtown for a sports league and won’t be coming until late afternoon. Since we were still going to wait for a little longer, we had some snacks first. We went to a nearby store and bought some canned goods. 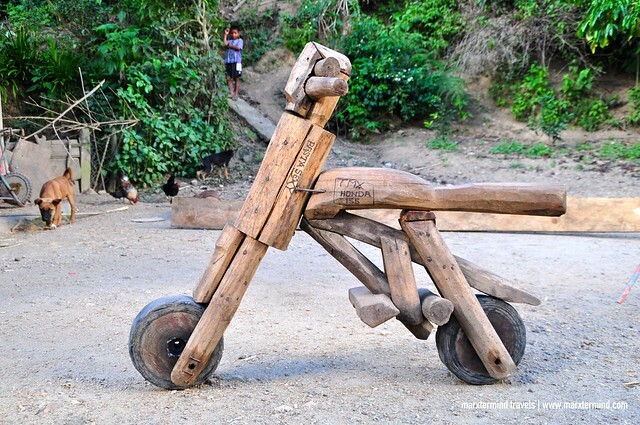 One thing that I found interesting at Butbut Proper is the wooden bikes. I saw one in the house that we were staying but unfortunately, the bike was broken. I bet it would be fun if we were able to try it but nevertheless, we just had our pictures taken with the bike and pretended that it was functioning. It was past 5:00 PM when Kuya Moises told us that we can already leave the village. We rented three motorbikes (PHP 300 each) for our group. The road from Butbut Proper on the way to the main road is overlong and winding. The road was paved in most of the areas but I didn’t expect that the motorbike ride to reach the main road was going to be that long. It was already around 7:00 PM when we have gotten to the Tinglayan proper. We rested for a while, and then went on a motorbike ride again going to Luplupa. The following day, we left the village of Luplupa. We paid Mang Johnny for our dues while staying in his guesthouse and Kuya Moises for the fee (PHP 1,000 per group) in guiding us the whole day in the three villages of Tinglayan. We took the Tabuk route to get back to Manila. 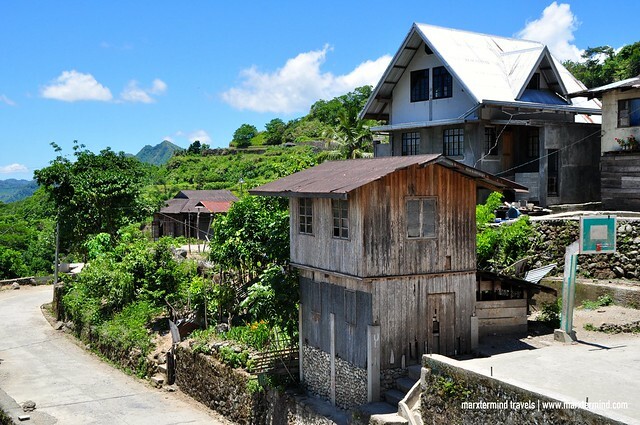 But before we finally left the province, we made a side trip first in one of the villages in Lubuagan. We visited the town of Mabilong, also known as Mabilong Weaver’s Village. At the main road from Luplupa, we waited for a Tabuk-bound jeepney that was expected to pass by the area at 9:00 AM. A few minutes after, the jeepney arrived crammed with passengers. We thought we weren’t able to board the jeepney anymore because even the top load was completely occupied. Elal, Doi and I rode the jeepney on top load while Julius as expected seated inside the jeepney. We told the driver to drop us off at Mabilong. The road on this part of Kalinga was also scenic. We passed by the Sleeping Beauty Mountain but even until today I couldn’t see how the mountain resembles to an image of a sleeping woman. We reached Mabilong Village in an hour of traversing the road. The village is just located along the main road. We instantly went to Ma-K Homestay, which was referred by the tourism office for a place that we could stay to while we were in the area. We were warmly welcomed by the owner of the guesthouse, Ms. Elizabeth Paat. We asked if we could be accompanied in the village to check out the practice of weaving and Ms. Elizabeth gladly helped us to find someone to take us to the village. 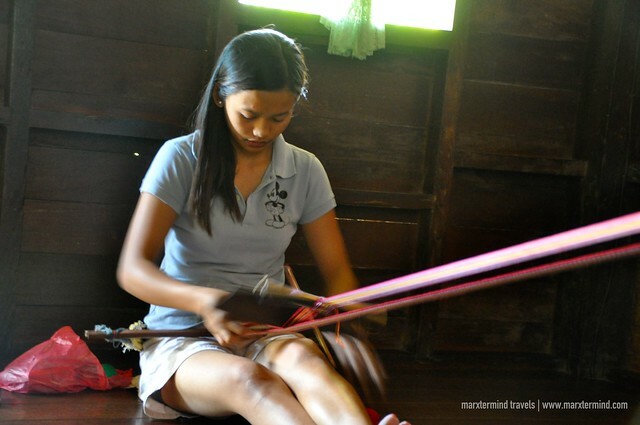 Mabilong is the center of the ethnic weaving industry in Kalinga. It showcases colorful ethnic back strap weaving. We were told that every single house in the village has a machine for weaving. 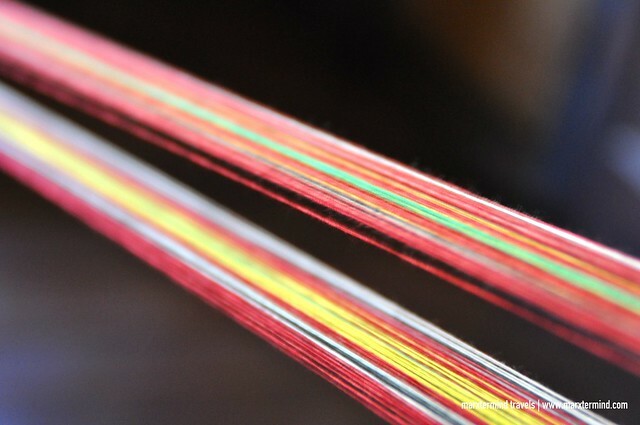 The village keeps the tradition of weaving. We went to a house and observed a young weaver do her work. We were able to see how the complex ethnic designs are made and how the colors are mixed. It really takes passion and skills to completely learn the process of weaving. It looked easy in the eye but it seemed really hard when put into practice. We planned to leave the village around noontime; however, we missed the last bus ride bound to Tabuk. We waited for another hour and then another if there would be a bus that would pass by to take us to our destination. Two other locals were also waiting. They were bound to Tabuk as well. When it was already getting late, I panicked a bit. I’ve asked the people in the guesthouse if there would be other ways for us to get to Tabuk. It was a piece of good fortune that a van passed by the guesthouse. We asked the driver if he could take us to Tabuk and we’ll just pay double for the fare if the van won’t be filled up with passengers completely. The driver agreed. We boarded the van as soon as it came back. Travel time to get to Tabuk is 2 hours. The time was still enough for us to catch the bus ride back to Manila. Passing by several towns, the van was then almost completely filled up by passengers. Hence, when we arrived in Tabuk, we paid the driver with the original fare (PHP 80). A Victory Liner Bus bound to Sampaloc (PHP 750) was about to leave when we arrived in the city. We immediately went to the ticketing office to inquire if there are still seats available but unfortunately, seats were already sold-out that day. We were advised to line up at the bus door entrance to chance on vacant seats. We lined up at the departing bus quickly. Few minutes after, we were told that there are seats available for us and the lady immediately provided us tickets for the seats. The bus left after a few minutes. The ride took 12 hours to reach Manila. I didn’t have high expectations when we visited Kalinga. 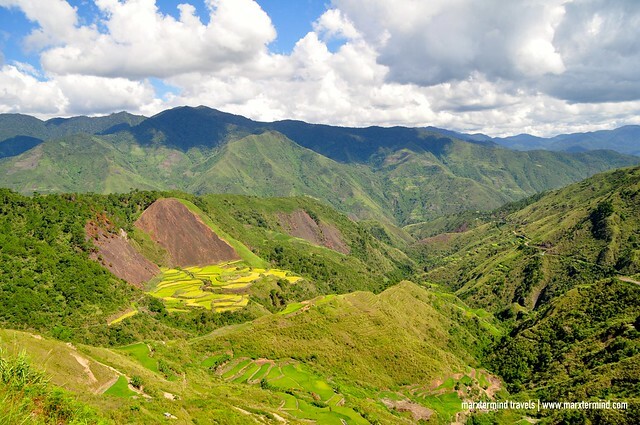 Before, I thought Kalinga was just all about Buscalan but after discovering some few villages in the province, I got more interested about the places here. In fact, I just couldn’t wait to find time to go back in Kalinga already. I can say that our trip to this beautiful and remote destination was one of the most memorable trips that I had. Our stay in the province was short but definitely it was an extraordinary one. Definitely, I will treasure the experiences I had in the villages, the people that we met, the surroundings, the hike and the journey that I had when we went to Kalinga. This has been in my bucketlist, I think its time I start planning to go there SOON! I have been waiting for people to join me but then seeing this post, GANDA. I like the interaction with the locals most of all. I'm sure, magugustuhan mo Kalinga! Grabi kayo ni atty. Unahan sa walang backlogs. 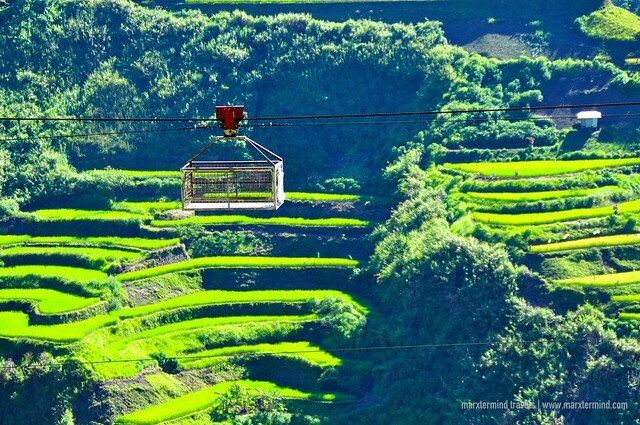 HUHU Nakakamiss ang kalinga ng Kalinga!